The drive to Sorrento from Naples is unbelievably breathtaking along cliffs overlooking the Bay of Naples and you will get a chance to take fantastic pictures of Mt. Vesuvius. 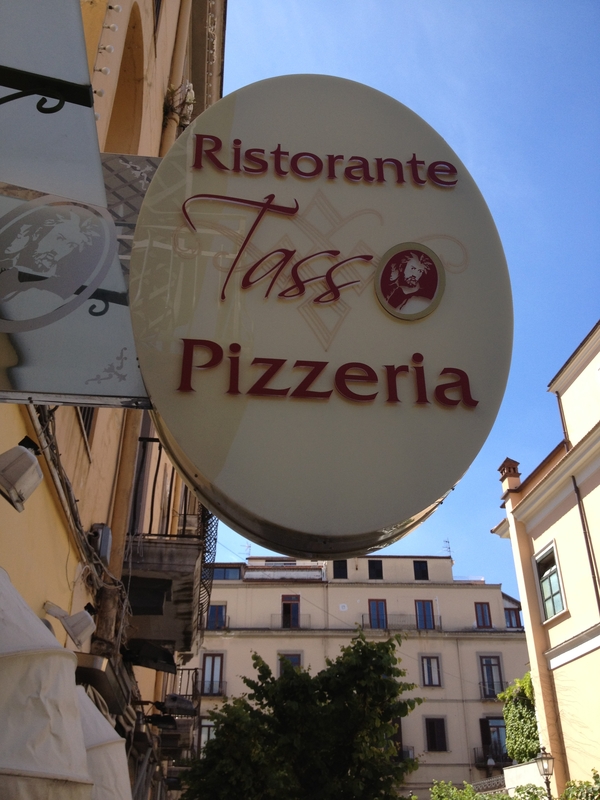 We were in Sorrento for just a day and found pizza making for the whole family at Ristorante Tasso. The restaurant is very open with inside or patio seating. While eating, sipping wine or waiting for your pizza to cook, you can watch the people walking about the town. The pizza making started out with an Italian waiter demonstrating how to make pizza and describing the meaning behind the Margarita Pizza (colors of the Italian flag). The table was set up with a pan, dough, sauce, mozzarella cheese, and fresh basil. 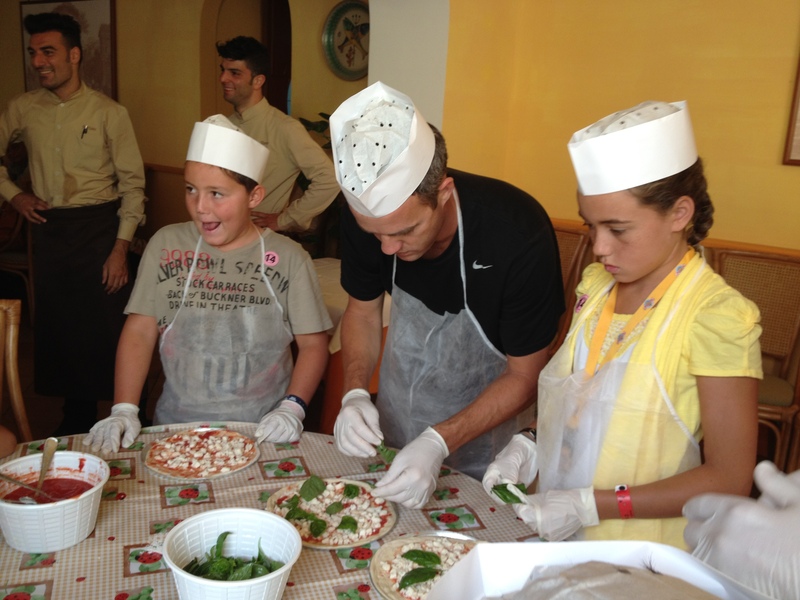 The kids loved making their own pizzas and then handing them off to a wood burning oven. 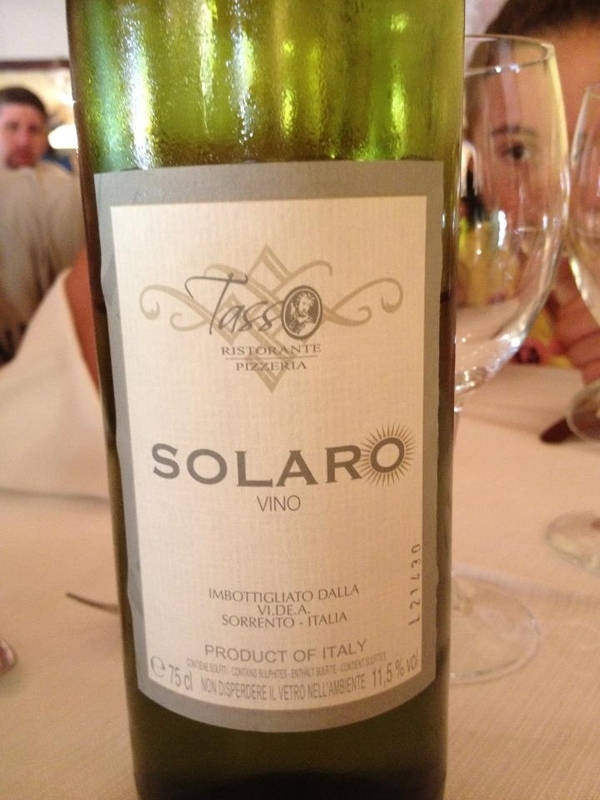 Tasso also makes their own wines and with our tour came an array of white wine selections throughout our lunch. Punch down the dough, divide in 1/2 and loosely form 2 balls. Place 1 ball in a well-greased plastic storage bag and store in the refrigerator for up to 2 days. Place the other on a floured surface, cover with a large inverted bowl, and allow to rest for 15 minutes. Place a large baking stone on the oven’s lowest rack and preheat to 400 degrees F.
Generously dust a wooden peel with flour and place dough on the peel. Make a disk shape by pressing dough with the heel of your hands, rotating the dough between presses. Continue to press and stretch dough into a 12-inch circle, about 1/8-inch thick. Spread the sauce on the pizza in a thin, even layer, making sure to leave a 1/4-inch border around the edges of the pizza. Season with salt and pepper. Top with the mozzarella. Slide the pizza onto the baking stone and bake for 10 to 14 minutes, or until the cheese is melted and bubbly and the bottom of the crust begins to brown. Remove from the oven, tear the basil leaves and scatter over the pizza. Slice with a pizza wheel and serve immediately. Stir the water, oil, sugar, and salt in a liquid measuring cup until the sugar dissolves. Whisk the flour and yeast in a large bowl, make a well in the center and add the liquid mixture. With a wooden spoon or your hand, gradually stir the flour into the liquid to make a rough dough. Pull the dough together into a ball, (if there is a bit of flour left, don’t fret). Turn the dough out onto a clean work surface dusted with flour. Knead until the dough is smooth and elastic, about 5 minutes, using more flour if necessary to keep from sticking. Divide into 4 equal portions, form into balls, and put on a lightly oiled baking sheet. Brush the tops of the dough with oil, cover with plastic wrap, and set aside to rise at room temperature until doubled, about 45 minutes. Heat the oil in a medium saucepan over medium-high heat. Sauté the onion and garlic, stirring, until lightly browned, about 3 minutes. Add the tomatoes and the herb sprigs and bring to a boil. Lower the heat and simmer, covered, for 10 minutes. 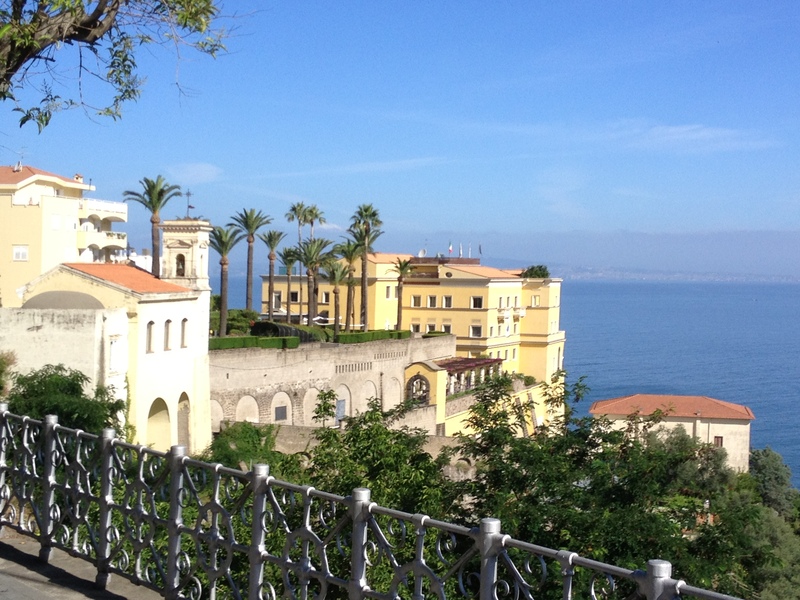 Sorrento is a very quaint town with a bunch of small shops, hotels and places to eat. 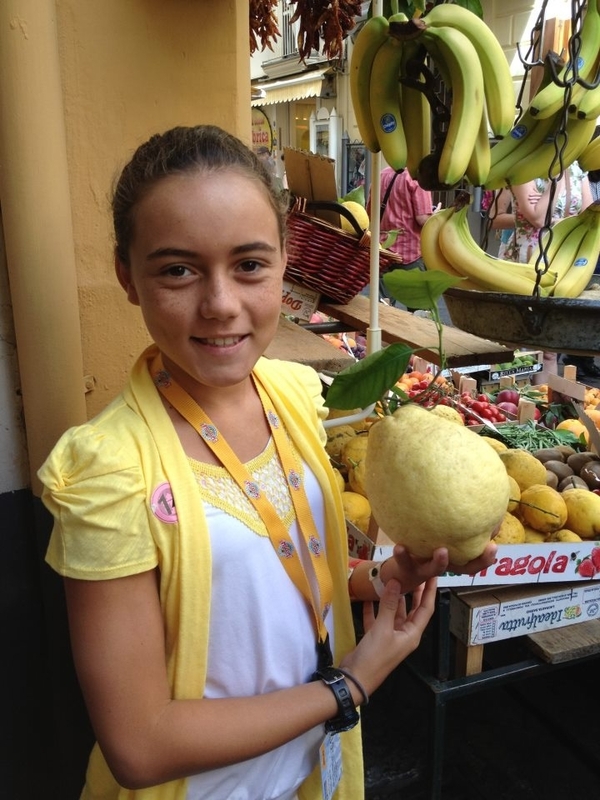 Many of the buildings are painted yellow with huge lemons everywhere. There are shops on every corner which sell Limón cello and offer samples. As we made our way through the shops, we stumbled along a store called Gioia Company which specializes in Inlaid Wood and provides tours. We purchased inlaid wood coasters as souvenirs for around 12€ each. The store will ship items to your home address as well. 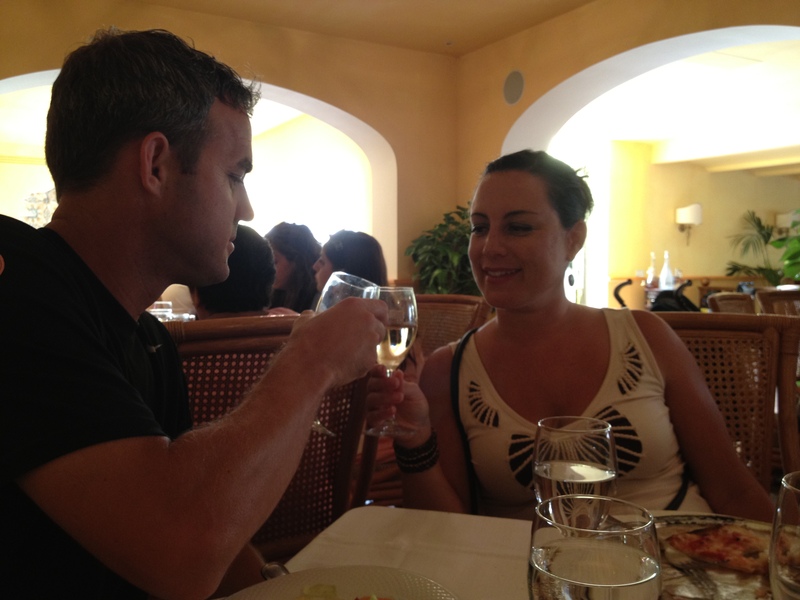 $$ saving tips: Take advantage of sampling the Limon cello. We went from shop to shop and sampled Limón chocolate, lemon candies and Limón cello. The kids ordered a frozen Limon drink which was much like a frozen lemonade. In reviewing the prices for pizza on the menu at Ristorante Tasso, it is much more cost effective to take the tour which comes with pizza, wine and dessert. The Amalfi Drive (connecting Sorrento and Amalfi) is a narrow road that threads along the high cliffs above the Tyrrhenian Sea. Ferry boats and hydrofoils provide services to Naples, Amalfi, Positano, Capri and Ischia. Sorrento’s sea cliffs and luxury hotels have attracted notable people, including Enrico Caruso and Luciano Pavarotti.